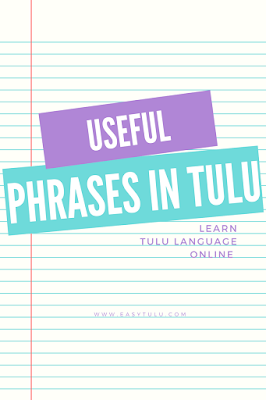 So far we have learned how to translate ‘would have’, ‘should have’ and ‘could have’ in Tulu. Today we are going to learn one more similar structure, i.e. 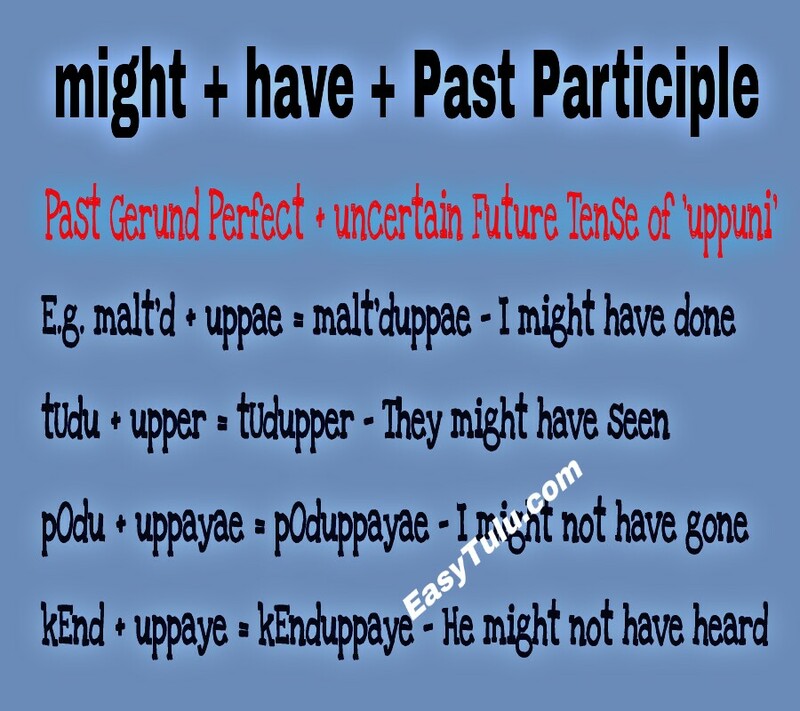 ‘may/might + have + Past Participle’. This form is used to talk about the possibility that something happened in the past and also used to refer to the present or future. I might have finished this work by tomorrow. English: I might have finished this work by tomorrow. English: I might not have finished this work by tomorrow. English: He may have missed the bus. Tulu: enna kAr’n Er kaND’dupper? English: Who might have stolen my car? Kannada: nanna kArannu yAru kaddirabahudu? English: Where might he have gone? 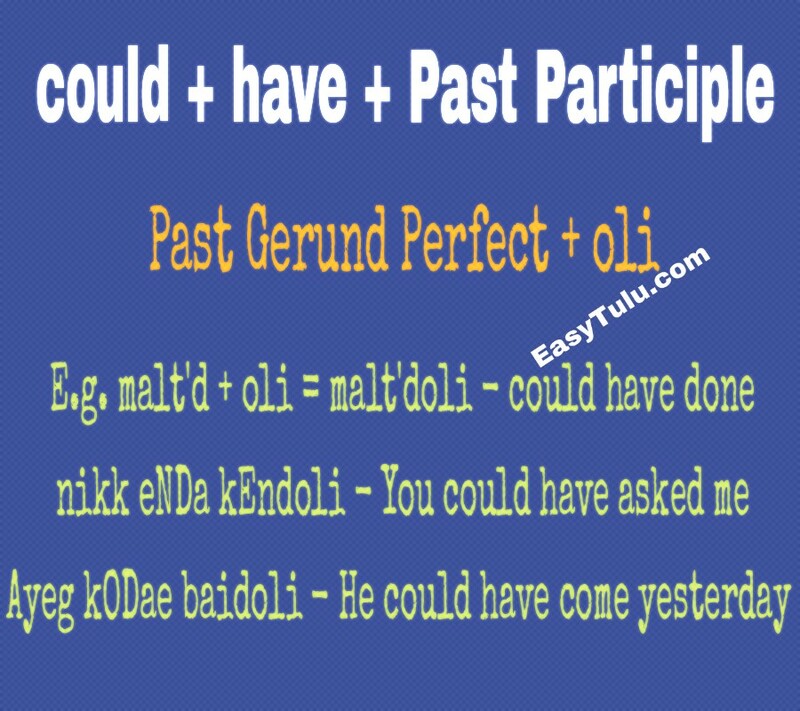 Today we are going to learn how to translate “could + have + Past Participle” in Tulu. This form is used to express that something was possible in the past, or you had the ability to do something in the past, but that you didn't do it. The negative form is used to express that something wasn't possible in the past, even if you had wanted to do it. Normally this form is used with dative case. Let us translate ‘could not’ in Tulu first. English: You could have passed the exam, but you didn’t try. English: She could have married him but she didn't want to. English: They could have helped me instead of just sitting there. English: He could have come little earlier. English: Could have been purchased a car if had money. English: I could not have done it alone. English: I could not have arrived any earlier, there was a traffic jam. English: I couldn’t have come even if you had called me. I was not feeling well. Today we are going to learn how to translate “should/must + have + Past Participle” in Tulu. This form is used to express something that would have been done, but that we didn't do it, or advice about the past, or regretting what we did or didn't do. Please review the previous lesson Conditional Mood – “would/wouldhave” and Potential mood (must, should, need, can, may) before we proceed. 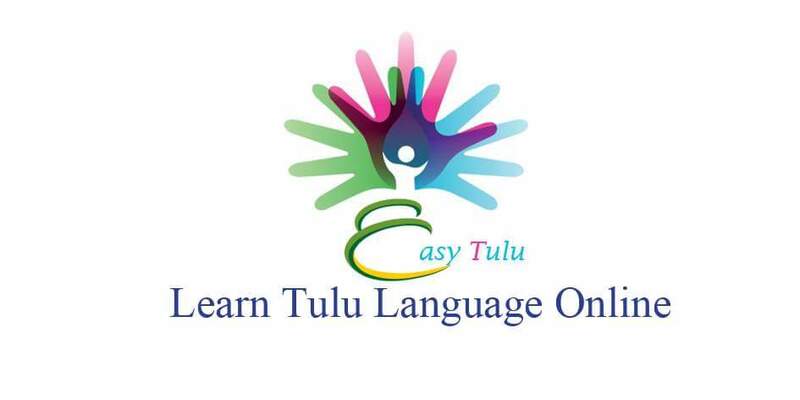 So you know how to translate ‘should’ or ‘must’ in Tulu. We have to add the suffix ‘oDu’ to the root verb. Let’s translate “He should not go” to Tulu first. 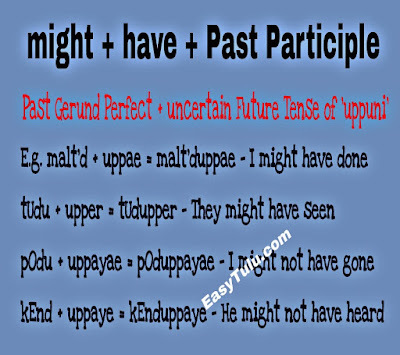 Now add “itt’ND” (Third person neuter simple past tense of the auxiliary verb ‘uppuni’) at the end. English: I should have got up early in the morning. English: I shouldn't have spoken to him like that. English: You shouldn’t have lied to me. 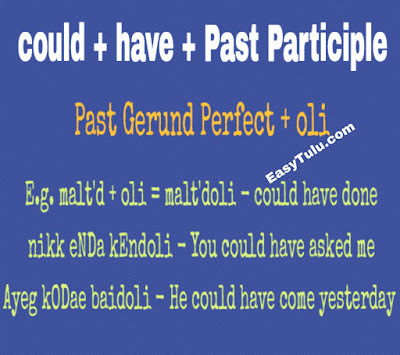 In English, we can also use ‘should have + + Past Participle’ to guess about events that may have happened. In Tulu we have slightly different form to guess about events that may have happened. The auxiliary verb ‘uppu’ (uppuni – To be) is used with potential mood suffix ‘oDu’. English: He should have reached Bangalore by now. English: They should have gone this morning. English: He/She should have slept by now.